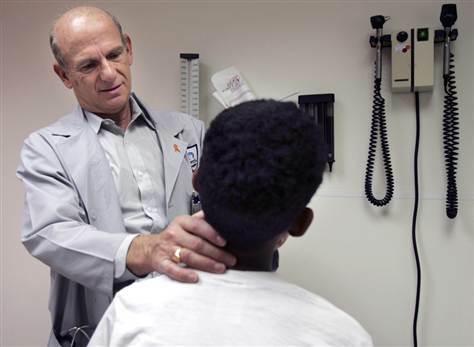 Dr. Ram Yogev, director of the pediatric HIV/AIDS program at Children's Memorial Hospital in Chicago, examines a former foster child who is now adopted, on April 8 in Chicago. The hospital participated in federally funded AIDS research that tested AIDS drugs on children, including foster children. WASHINGTON — Government-funded researchers tested AIDS drugs on hundreds of foster children over the past two decades, often without providing them a basic protection afforded in federal law and required by some states, an Associated Press review has found. The research funded by the National Institutes of Health spanned the country. It was most widespread in the 1990s as foster care agencies sought treatments for their HIV-infected children that weren’t yet available in the marketplace. The practice ensured that foster children — mostly poor or minority — received care from world-class researchers at government expense, slowing their rate of death and extending their lives. But it also exposed a vulnerable population to the risks of medical research and drugs that were known to have serious side effects in adults and for which the safety for children was unknown. states — Illinois, Louisiana, Maryland, New York, North Carolina, Colorado and Texas — and involved more than four dozen different studies. The foster children ranged from infants to late teens, according to interviews and government records. Several studies that enlisted foster children reported patients suffered side effects such as rashes, vomiting and sharp drops in infection-fighting blood cells as they tested antiretroviral drugs to suppress AIDS or other medicines to treat secondary infections. In one study, researchers reported a “disturbing” higher death rate among children who took higher doses of a drug. That study was unable to determine a safe and effective dosage. The government provided special protections for child wards in 1983. They required researchers and their oversight boards to appoint independent advocates for any foster child enrolled in a narrow class of studies that involved greater than minimal risk and lacked the promise of direct benefit. Some foster agencies required the protection regardless of risks and benefits. Advocates must be independent of the foster care and research agencies, have some understanding of medical issues and “act in the best interests of the child” for the entirety of the research, the law states. However, researchers and foster agencies told AP that foster children in AIDS drug trials often weren’t given such advocates even though research institutions many times promised to do so to gain access to the children. New York City could find records showing 142 — less than a third — of the 465 foster children in AIDS drug trials got such monitors even though city policy required them. The city has asked an outside firm to investigate. Likewise, research facilities including Chicago’s Children’s Memorial Hospital and Johns Hopkins University in Baltimore said they concluded they didn’t provide advocates for foster kids. Some states declined to participate in medical experiments. Tennessee said its foster care rules generally prohibit enlisting children in such trials. California requires a judge’s order. And Wisconsin “has absolutely never allowed, nor would we even consider, any clinical experiments with the children in our foster care system,” spokeswoman Stephanie Marquis said. Officials estimated that 5 percent to 10 percent of the 13,878 children enrolled in pediatric AIDS studies funded by NIH since the late 1980s were in foster care. More than two dozen Illinois foster children remain in studies today. Some foster children died during studies, but state or city agencies said they could find no records that any deaths were directly caused by experimental treatments. Researchers typically secured permission to enroll foster children through city or state agencies. And they frequently exempted themselves from appointing advocates by concluding the research carried minimal risk and the child would directly benefit because the drugs had already been tried in adults. “Our position is that advocates weren’t needed,” said Marilyn Castaldi, spokeswoman for Columbia Presbyterian Medical Center in New York. If they decline to appoint advocates under the federal law, researchers and their oversight boards must conclude that the experimental treatment affords the same or better risk-benefit possibilities than alternate treatments already in the marketplace. They also must abide by any additional protections required by state and local authorities. Many of the studies that enrolled foster children occurred after 1990 when the government approved using the drug AZT — an effective AIDS treatment — for children. Arthur Caplan, head of medical ethics at the University of Pennsylvania, said advocates should have been appointed for all foster children because researchers felt the pressure of a medical crisis and knew there was great uncertainty as to how children would react to AIDS medications that were often toxic for adults. “It is exactly that set of circumstances that made it absolutely mandatory to get those kids those advocates,” Caplan said. “It is inexcusable that they wouldn’t have an advocate for each one of those children. “When you have the most vulnerable subjects imaginable — kids without parents — you really do have to come in with someone independent, who doesn’t have a dog in this fight,” he said. Those who made the decisions say the research gave foster kids access to drugs they otherwise couldn’t get. And they say they protected the children’s interest by carefully explaining risks and benefits to state guardians, foster parents and the children themselves. “I understand the ethical dilemma surrounding the introduction of foster children into trials,” said Dr. Mark Kline, a pediatric AIDS expert at Baylor College of Medicine. He enrolled some Texas foster kids in his studies, and doesn’t recall appointing advocates for them. Illinois officials directly credit the decision to enroll HIV-positive foster kids with bringing about a decline in deaths — from 40 between 1989 and 1995 to only 19 since. NIH, the government health research agency that funded the studies, did not track researchers to determine if they appointed advocates. Instead, the decision was left to medical review boards made up of volunteers at each study site. A recent Institute of Medicine study concluded those Institutional Review Boards (IRBs) were often overwhelmed, dominated by scientists and not focused enough on patient protections. An ethicist who served 22 years on such boards said they lack the resources to ensure the safety of foster children. “Over the last half century, IRBs have basically broken under the strain of some of the structural changes in research,” said Gregory E. Pence, a University of Alabama-Birmingham bioethicist. The U.S. Office for Human Research Protections, created to protect research participants after the infamous Tuskegee syphilis studies on black men, is investigating the use of foster children in AIDS research. The office declined to discuss the probe. NIH said it considers patient safety its top priority and awaits the outcome of the investigation. “If we find that patient protections need further strengthening, we will take action to do so,” spokesman John Burklow said. AP’s review found that if children were old enough — usually between 5 and 10 — they also were educated about the risks and asked to consent. Sometimes, foster parents or biological parents were consulted; other times not. “Our policy was to try and contact the (biological) parents because it was fairly common when we got done the foster kid would go back to the parents,” said Dr. Ross McKinney, a pediatrics AIDS expert at Duke University. Research and foster agencies declined to make foster parents or children in the drug trials available for interviews, or to provide information about individual drug dosages, side effects or deaths, citing medical privacy laws. Other families who participated in the same drug trials told AP their children mostly benefited but parents needed to carefully monitor potential side effects. Foster children, they said, need the added protection of an independent advocate. “I don’t believe a foster care parent can do it,” said Vinnie DiPoalo, a New Jersey woman whose 10-year-old adopted son has participated in three AIDS drug trials. “There are informed consents that have to be signed. There are follow-up blood appointments. “I think that’s the role the advocate should take, because a foster parent may only have this child for three months and then the child moves on and someone needs to be watching all the time,” she said. Many studies that enlisted foster children involved early Phase I and Phase II research — the riskiest — to determine side effects and safe dosages so children could begin taking adult “cocktails,” the powerful drug combinations that suppress AIDS but can cause bad reactions like rashes and organ damage. Some of those drugs were approved ultimately for children, such as stavudine and zidovudine. Other medicines were not. Illinois officials confirmed two or three foster children were approved to participate in a mid-1990s study of dapsone. Researchers hoped the drug would prevent a pneumonia that afflicts AIDS patients. Researchers reported some children had to be taken off the drug because of “serious toxicity,” others developed rashes, and the rates of death and blood toxicity were significantly higher in children who took the medicine daily, rather than weekly. “An unexpected finding in our study was that overall mortality while receiving the study drug was significantly higher in the daily dapsone group. This finding remains unexplained,” the researchers concluded. Another study involving foster children in the 1990s treated children with different combinations of adult antiretroviral drugs. Among 52 children, there were 26 moderate to severe reactions — nearly all in infants. The side effects included rash, fever and a major drop in infection-fighting white blood cells. New York City officials defend the decision to enlist foster children en masse, saying there was a crisis in the early 1990s and research provided the best treatment possibilities. Nonetheless, they are changing their policy so they no longer give blanket permission to enroll children in preapproved studies. Researchers likewise defend their work, saying they often sat with foster families to explain the risks and benefits, and provided them literature and 24-hour phone numbers. “We talk about it. Then they come the next time. There is no rush,” explained Dr. Ram Yogev, the chief pediatric AIDS researcher in Chicago whose patients include a large number of foster children.